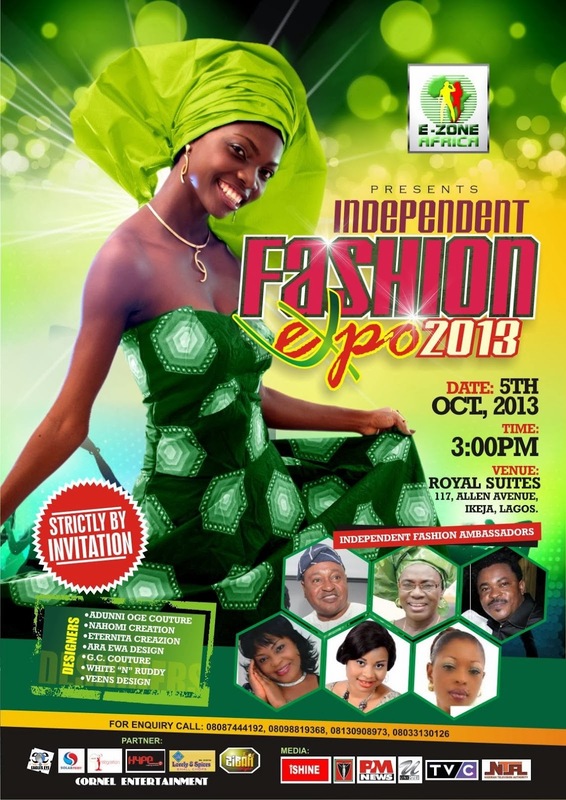 MAJOR Nigerian movie celebrities would storm for the second edition of INDEPENDENT FASHION EXPO 2013. The fashion expo which is produced by E-Zone Africa is billed to hold at 117, Allen off Awolowo Way Ikeja would witnessed special exhibition for emerging Pan-Africa designers. This is coming barely a year after the debut edition which was reputed as the major fashion event during the Nigeria Independence Anniversary celebration. The fashion expo according to the chairman organizing committee, Engr. Lambert Dike would attended be graced by bigwigs in the movies industry including Prince Jide Kosoko, Mama Rainbow, Victor Osuagwu while others include Ayo Badmus, Princess Sola Kosoko, Bukky Ogunnote, and Blessing Patrick amongst other top Nollywood practitioners. Dike said the event would wear a different look as the celebrities would walk the run-way with the design made by the designers. He indicated that this is part of plans to identify with the concept of the event which hopes to create a brand signature and identity typical of African designs. Expected to showcase at the event are designers in the Nigerian Fashion industry including Ara-Ewa Creation, Eternita Creazioni, White and Ruddy, Adunni Oge Couture others include RM Bro Design, Ay Fit, Nahomi Creation, Veens Couture while GC Couture from Benin Republic would grace the event as the guest designer. The event anchored by award winning comedian, Dr. Smile and Bunmi Portable(City People) would be graced by stakeholders in both entertainment and fashion industry amongst other major dignitaries. It would also witness musical performance by Tunde Joseph (Host Artiste) joined with other top music artistes. It would also be sponsored by Eagle-Eye, Kiss Mix, Multiple Vision, lovely and Spicy small chops, others include major sponsors. “This project was initiated last year, and it has created significant impacts in the lives of participants because of its unrivalled vision. It is the foremost and the leading fashion show ever produced during Nigeria Independence Week. Since inception has succeeded in raising hopes through the making of Super-Models and Super-Designers in the fashion industry. “We hope to show to the world that Africa has the capacity to make impact with its creative industry and it has potentials to make a larger impact in the global fashion industry.” Dike said.